Image © [caption id="" align="alignnone" width="566"] ©Freedom House[/caption] The International Olympic Committee has always attained the right to ban certain individuals or groups from the Olympics games. In 1964 South Africa was excluded after it failed to meet the IOC’s demand for apartheid policies to be banned in the country. From these major ethical political reasons, to the controversial ban recently of artist Kieran O'Rourke - as a result of his involvement with a graffiti website numerous years ago - the reasons for banning people from the games have been a point of debate across the world. Sporting events across the world have taken place in troubled areas, such as the Formula 1 in Bahrain, so should we consider sporting events and politics separately? What is a viable justification for an official exclusion from the games and is this applicable today with the recent ban of Syrian officials? The Syrian chief of the Olympic committee has not been granted his visa by the British Government, which would ensure his attendance at the Games. This was announced despite Moiwaffak Joumaa’s recent statement that "We have never been absent from any Olympic games in the past apart from the (1932) Los Angeles games. And of course we are committed and determined to take part and we shall not be absent from the London games." Other pro-regime members, such as Assad’s wife who grew up in London and had a double page spread in Vogue not long ago, have also been prohibited from travelling within EU borders. Although unconfirmed by the IOC, the extremity of Bashar Al-assad’s actions make it unlikely that any Syrian officials who serve as figures of support for the regime will be approved a visit during London 2012. The UK prides itself on its stand for democracy and has been highly verbal regarding its concern for, as William Hague phrases it, the “delusional” government of Syria. But where is the line drawn for those allowed, and others who aren’t, and is it right to consider politics simultaneously with a sporting event such as the Olympics? The International Olympic Committee work hard to promote the Games as a global event which unites nations and seems to encourage ideals shared across the Globe. But are the rules and regulations of the Games consistent? Is there not a contradiction in banning General Mowaffak Joumaa, but allowing the athletes to take part as representatives of the flag of the Ba’ath party which has been led by the Assad family for over forty years? Athletes’ participation in the Olympics are considered individual efforts to bring pride to their home countries. How would a Syrian celebrate winning a title for their country despite the devastation occurring across the region at present? The ex-Syrian goalkeeper Abdelbasset Saroot claimed of the participants, "they don't want to play for a flag that they have no pride or faith in". How would observers react to Syrian medallists - the most recent being Nasser Al Shami who won a bronze medal in the boxing? By banning Syria we are also making a statement that we choose to include those other countries which too oppress their people and still practice policies that here in the UK, we see strongly as a violation of human rights – such as the death penalty. Jeremy Hunt, who is the culture secretary, stated of the Olympics that it would not be used as an opportunity to “preach about our values”. 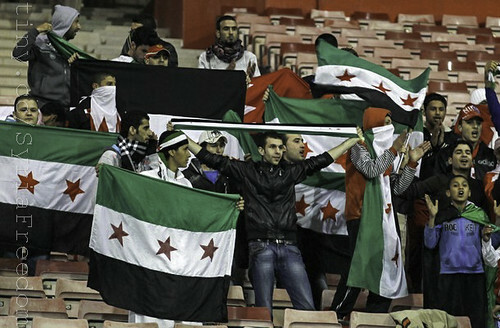 Families of athletes, along with the well-known Syrian footballer Ahmed Al Shedan, have been killed during the conflict and some participants in this years Olympics most certainly are keen to compete to save both their own and their families lives. However, Ahmed Hamsho who has family ties with both the president and the Syrian Equestrian Federation, is claiming that the entire team are supporting their government. His father has been banned from the Games as a result of alleged corruption – so should his son be allowed to compete? If the IOC were to ban all Syrians from the Games – would this be seen as isolating the country which needs international help? Would it be wrong to step back completely and close our borders to those Syrians whom deserve a place at the Games due to the difficulty in verifying their reasons for attending? The International Olympic Committee has always attained the right to ban certain individuals or groups from the Olympics games. In 1964 South Africa was excluded after it failed to meet the IOC’s demand for apartheid policies to be banned in the country. From these major ethical political reasons, to the controversial ban recently of artist Kieran O’Rourke – as a result of his involvement with a graffiti website numerous years ago – the reasons for banning people from the games have been a point of debate across the world. Sporting events across the world have taken place in troubled areas, such as the Formula 1 in Bahrain, so should we consider sporting events and politics separately? What is a viable justification for an official exclusion from the games and is this applicable today with the recent ban of Syrian officials? The Syrian chief of the Olympic committee has not been granted his visa by the British Government, which would ensure his attendance at the Games. This was announced despite Moiwaffak Joumaa’s recent statement that “We have never been absent from any Olympic games in the past apart from the (1932) Los Angeles games. And of course we are committed and determined to take part and we shall not be absent from the London games.” Other pro-regime members, such as Assad’s wife who grew up in London and had a double page spread in Vogue not long ago, have also been prohibited from travelling within EU borders. Although unconfirmed by the IOC, the extremity of Bashar Al-assad’s actions make it unlikely that any Syrian officials who serve as figures of support for the regime will be approved a visit during London 2012. The UK prides itself on its stand for democracy and has been highly verbal regarding its concern for, as William Hague phrases it, the “delusional” government of Syria. But where is the line drawn for those allowed, and others who aren’t, and is it right to consider politics simultaneously with a sporting event such as the Olympics? The International Olympic Committee work hard to promote the Games as a global event which unites nations and seems to encourage ideals shared across the Globe. But are the rules and regulations of the Games consistent? Is there not a contradiction in banning General Mowaffak Joumaa, but allowing the athletes to take part as representatives of the flag of the Ba’ath party which has been led by the Assad family for over forty years? Athletes’ participation in the Olympics are considered individual efforts to bring pride to their home countries. How would a Syrian celebrate winning a title for their country despite the devastation occurring across the region at present? The ex-Syrian goalkeeper Abdelbasset Saroot claimed of the participants, “they don’t want to play for a flag that they have no pride or faith in”. How would observers react to Syrian medallists – the most recent being Nasser Al Shami who won a bronze medal in the boxing? By banning Syria we are also making a statement that we choose to include those other countries which too oppress their people and still practice policies that here in the UK, we see strongly as a violation of human rights – such as the death penalty. Jeremy Hunt, who is the culture secretary, stated of the Olympics that it would not be used as an opportunity to “preach about our values”. Families of athletes, along with the well-known Syrian footballer Ahmed Al Shedan, have been killed during the conflict and some participants in this years Olympics most certainly are keen to compete to save both their own and their families lives. However, Ahmed Hamsho who has family ties with both the president and the Syrian Equestrian Federation, is claiming that the entire team are supporting their government. His father has been banned from the Games as a result of alleged corruption – so should his son be allowed to compete? If the IOC were to ban all Syrians from the Games – would this be seen as isolating the country which needs international help? Would it be wrong to step back completely and close our borders to those Syrians whom deserve a place at the Games due to the difficulty in verifying their reasons for attending? Louisa Tratalos Louisa Tratalos graduated in Visual Culture from Goldsmiths, University of London. Her interests lie in human rights and environmental issues, with a specific current focus on the Syrian conflict. She appreciates the importance of online digital content especially as a political tool for young people. She aims to follow a career in documentary film-making and the production of videos which can serve as campaign vehicles.